Greased the baking tray that you want to use. Take approximately 5 fillo leaves, basting between leaves with butter. Spread the crushed walnuts, making sure the fillo pastry is covered. Cover with 5 basted sheets fillo pastry as before. Repeat step 3 and 4 with the crushed cashew nuts. Repeat step 3 and 4 with the crushed pistachios. Brush the top sheet with melted butter mix with olive oil (if you like). Place in a preheated oven 365F (160C) for 45 minutes - 1 hour until brown and crisp. While the fillo is cooking, make the syrup. Make syrup by boiling all the syrup ingredients on low heat until it thicken a little. Add the lemon juice with care and leave to cool. Pour over the cooked and cut pastry. Cut the pastry before baking - if you cut after baking, they easily break. Use more nuts (of your choice) if you want more nutty flavor. 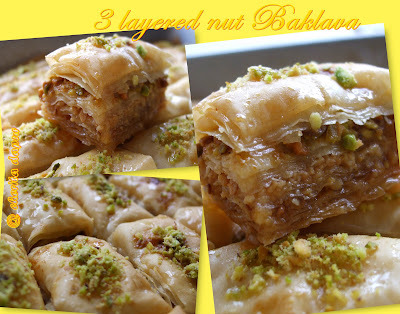 After pouring the syrup, only then sprinkle some crushed pistachios for decoration. Leave for at least overnight / 6 hours to let the syrup soaked into all the layers of fillo pastry before enjoying. kak ain..sedap ke ltk mcm2 jenis kacang?? ish xleh jadi ni..nk kna try buat jgk la..wish me luck! p/s: akak ltk brapa byk lime utk gnti air gula buah tu? Sedap sangat... lagi tebal layer kacang lagi sedap... tp kuih ni manis tau, kalau nadwah tak suka manis.. cuba kurangkan gula. InsyaAllah mesti jadiknye.. buatlah dlm bekas kecik dulu utk trial, kalau suka boleh buat lagi.. lime and lemon tu kak ain letak dalam 1 sudu besar. Ok Selamat mencuba.